Hello loves, I'm back with another nail art look to share with you! As you may have noticed I'm not doing the 31 Day Challenge this year, but that doesn't mean I'm not still going to have nail art to share with you! I'm away for a bit of the month so getting 31 full looks done and edited and posted just seemed like too much for me this year. But I've enjoyed seeing what the rest of you have put together, so far! The look I'm sharing with you today is one of my favourites, and I know I say that a lot. But I REALLY mean it this time! 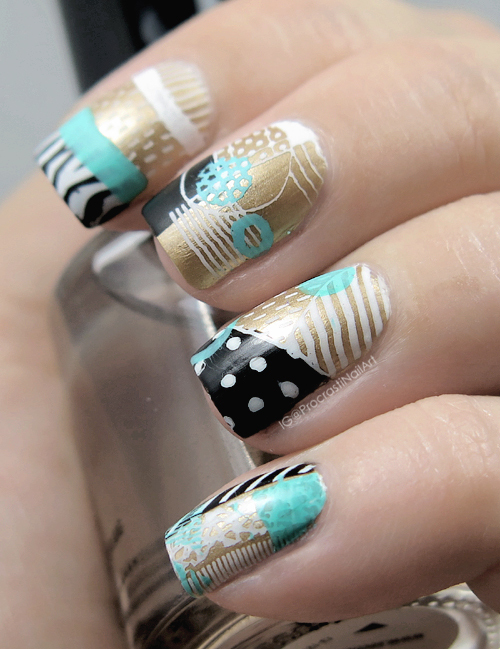 The colour combo + the stamping designs I used = perfection as far as I'm concerned! So here's what I used to put this together: I started off with a gold base using Sally Hansen Complete Salon Manicure Fool's Gold, and then added some random black blocks over the gold with Ceramic Glaze Little Black Dress. Next was the tricky part: I used Ceramic Glaze Pure and MoYou London Trend Hunter 03 and was careful to choose full-nail outline designs that would have a piece which overlapped the black polish exactly. 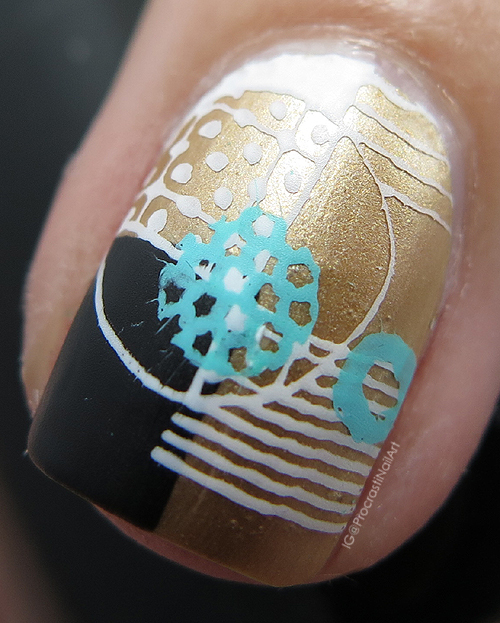 I carefully stamped it on, and then used Mundo de Unas Light Blue and MoYou London Holy Shapes 19 to add some extra geometric details. Unfortunately the blue wasn't as opaque over the other colours as I had hoped. Ah well! When the whole thing was dry I sealed it with a glossy top coat, and then covered it in a layer of matte coat. 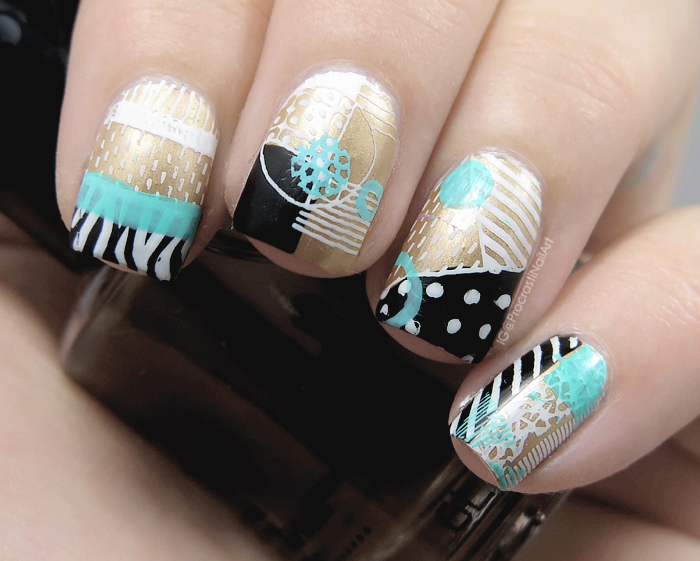 These nails look pretty awesome! I'm really loving this colour combination! ...this is everything... layered stamping like this... drool! I really love this mani! You did an amazing job! Looks like a lot of steps went in to making this mani. It turned out fabulous.